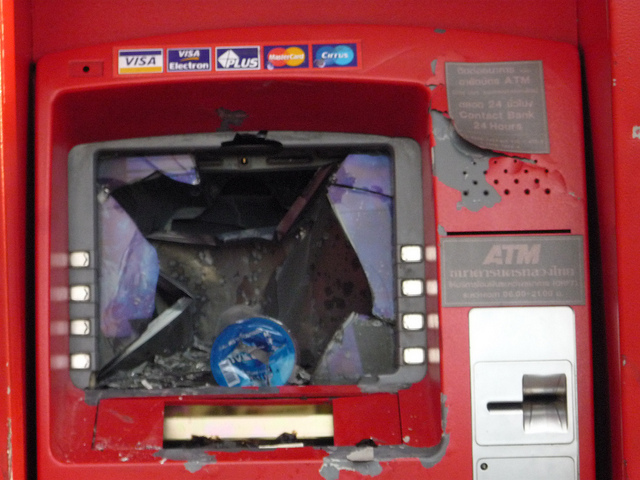 During the International Week in Solidarity with the Anarchist prisoners more than a dozen ATMs in different neighborhoods of Madrid were sabotaged. The tools for this type of sabotage are easy and simple: hammers and sprays. We understand solidarity as the continuity of the struggle that has led our comrades to state prisons. Anarchist solidarity is much more than mere written word or an assistance work with the prisoners. This solidarity is materialized in the attack on the structures of capitalism and the State and seeks to deepen the conflict through direct action. Down the walls of the prisons. Long live Anarchy! For the repressed comrades by Operation Scripta Manent! For the repressed comrades after the G20 summit in Hamburg! For Indonesian anarchists prosecuted after May 1! For Lisa and all the imprisoned anarchists!